One day last week I received a message on my Facebook timeline from a NZ company called Draw'n In. 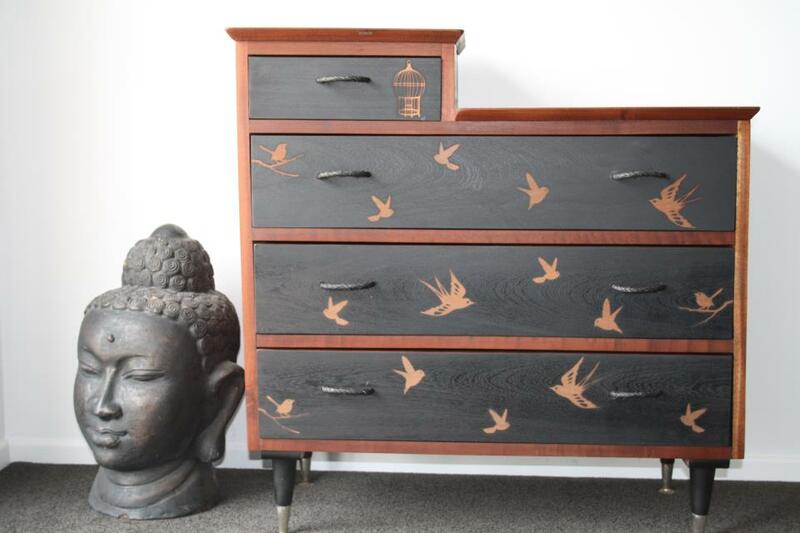 When I checked out their page, I was blown away by the images of refurbished drawers that had been transformed into works of art. 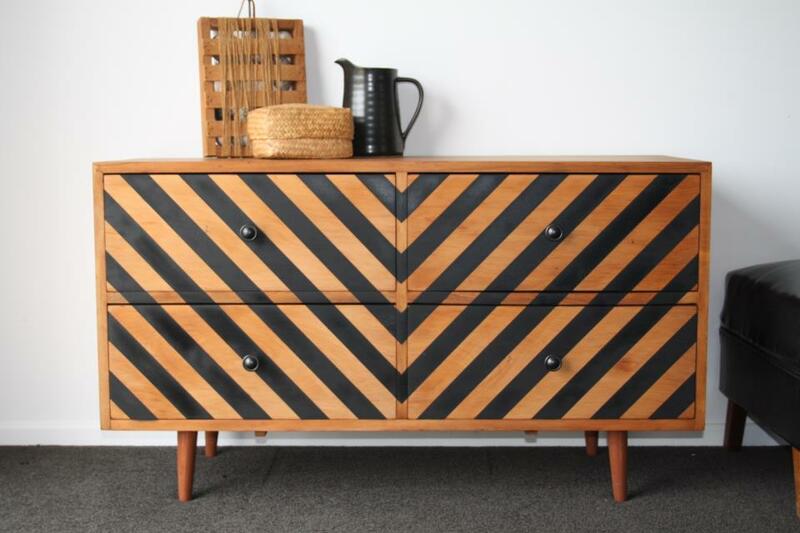 I knew straight away that these eyecatching, limited edition pieces sold on Trade Me (New Zealand's version of eBay) were too good not to share with you all, so I got in touch and arranged an interview. 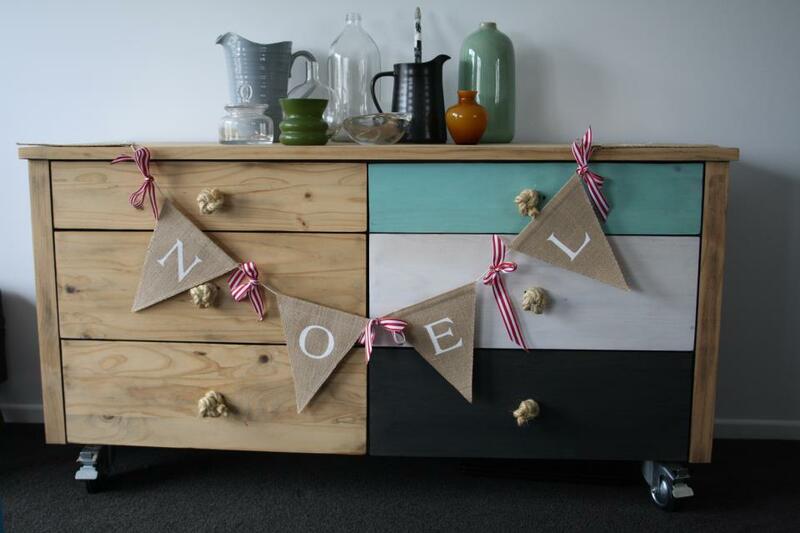 Emma-Jayne (EJ) Scott of Auckland is the talented designer behind these incredible upcycled pieces of furniture. When reading through her answers I literally got goosebumps. Her energy and enthusiasm for what she does is infectious and you can't help but be inspired by how she discovered her true passion. Keep reading to find out more. Can you tell us a bit about your background - how and when did Draw'n In come about? I have been running a promotional products company for the last six years from home, which was fabulous as it allowed me to raise my two children from home. The recession hit the company hard, and life started to get quite tricky, financially. Not one to give in I needed to find something that would allow me to stay at home and be a mum but also generate some revenue and get out the creative energy that is constantly there. We had just finished renovating our lounge/kitchen area and I had been looking everywhere for a set of drawers to act as a buffet unit and house all the kids toys and movies. 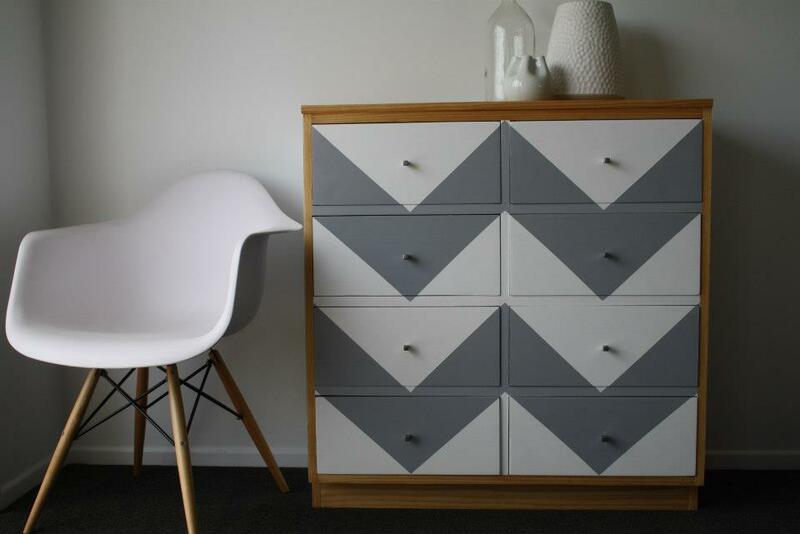 I looked everywhere, until I found a unit in Freedom but it was two small or way out of my price range, and I thought “I can make that myself!” So I went home and started looking on Trade Me, found a set of drawers and set to work on them. When completed I put them in the lounge and thought "that was fun and they look pretty cool". Friends and family started coming around, they would walk in and immediately say WHERE DID YOU GET THOSE (referring to the drawers) AND DO THEY HAVE ANYMORE?? I would modestly say I made them to which they would say "oh my goodness they are amazing and you should do more!". 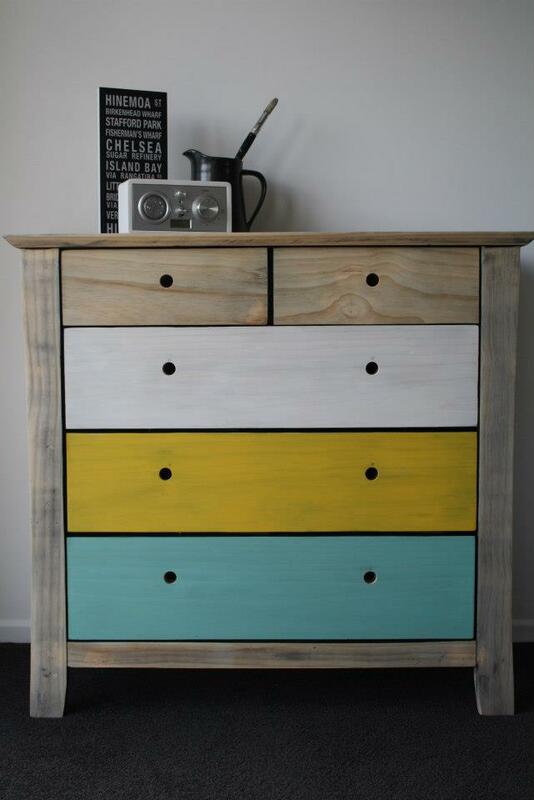 After five months or so of this continually happening, I said to my husband, I think I am going to start doing up old drawers as one off pieces of artwork…….and the rest is history. So it started in in August 2012 with number 2 and I am now up to number 25. 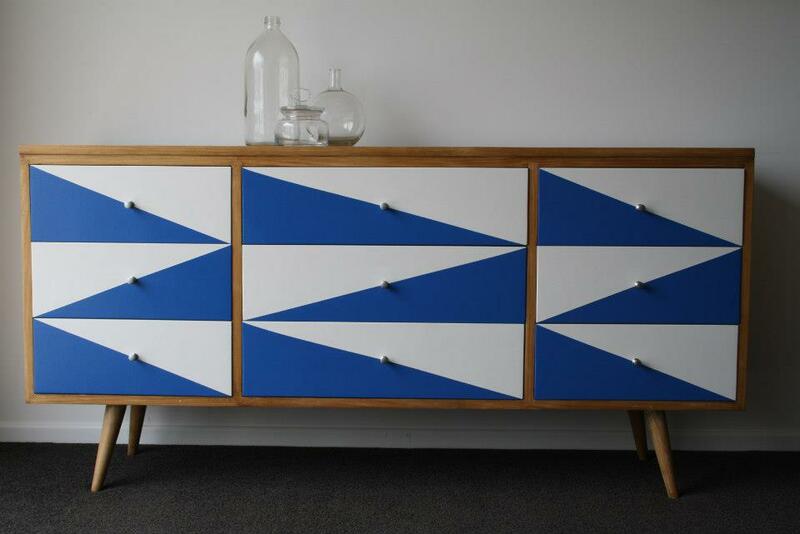 How would you describe your design process - do you source the drawers with an idea in mind or does it work the other way around? I generally buy the drawers, and get them home put them in the shed and almost immediately know what I want to do with them. It doesn’t always go to plan and I need to tweak the design a little but generally they take on a life of their own. I just love it, I feel like I am giving a person in a retirement village another 20 years at least on their life and saying "there you go, go be something you never thought you would be, you never know what exciting adventures you will go on." 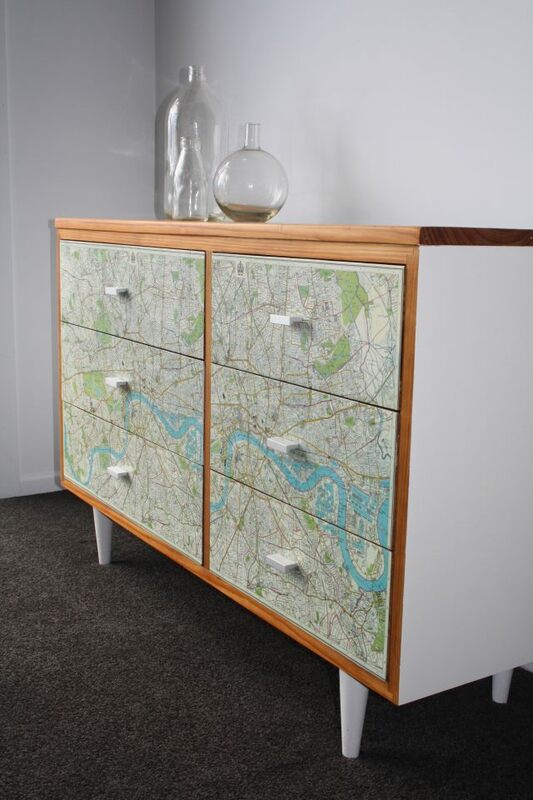 Where do you find inspiration for your furniture designs? It’s everywhere, I have always watched the backgrounds of movies, programs and ads, and never what is actually going on. 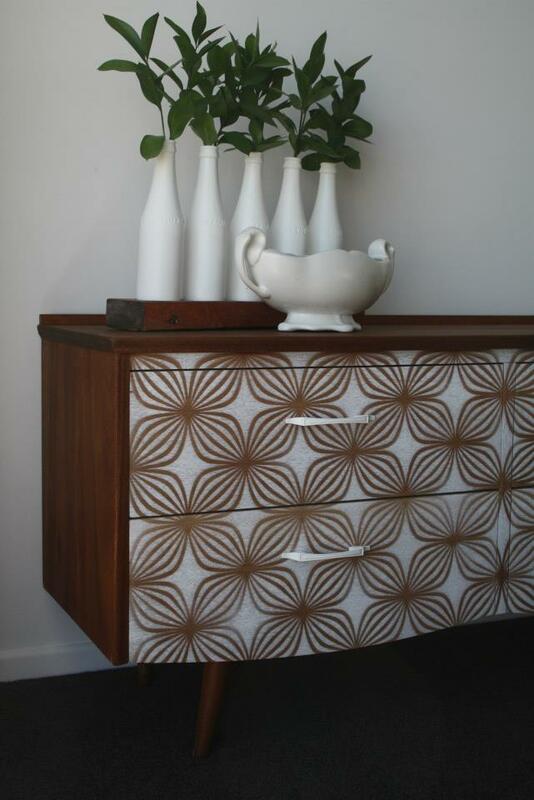 I love wallpaper designs, fabrics, magazines, rugs anything that has a pattern that catches my eye. I wake up in the middle of the night and I have design ideas bursting from my brain. I had to buy a journal to get them out of my head as I couldn't hear anyone talking nor concentrate on anything. I just wanted to be in the shed constantly. You promote Draw'n In via your Facebook page and sell your products on Trade Me. Are you hoping to grow and expand ... where would you like to take it? People keep asking me this and I would love to see my drawers everywhere but at the moment I am concentrating on "the now". Who knows where the future will take us, I am just so happy doing what I am doing, that is enough for me ….for now. 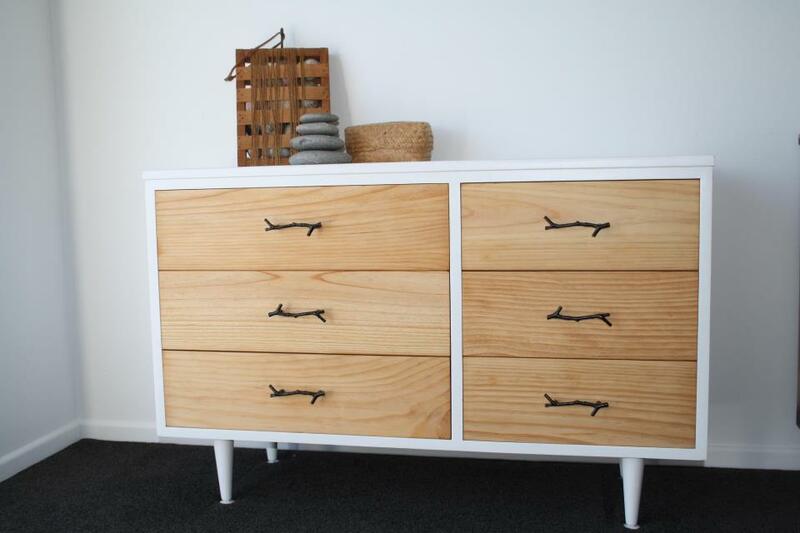 What's been your favourite drawer design so far? Hahaha each piece I have loved, but once it is completed and has been sitting in my lounge for a week, I am ready to send it on to its new home/life, to make room for the next. One that stands out for me recently would have to be number 22 (image below). Can you tell us what you're currently working on? I have three very individual designs that are coming up. I am loving orange at the moment so no doubt this will feature in at least two of them. Looking through your Facebook page, the comments are fantastic. 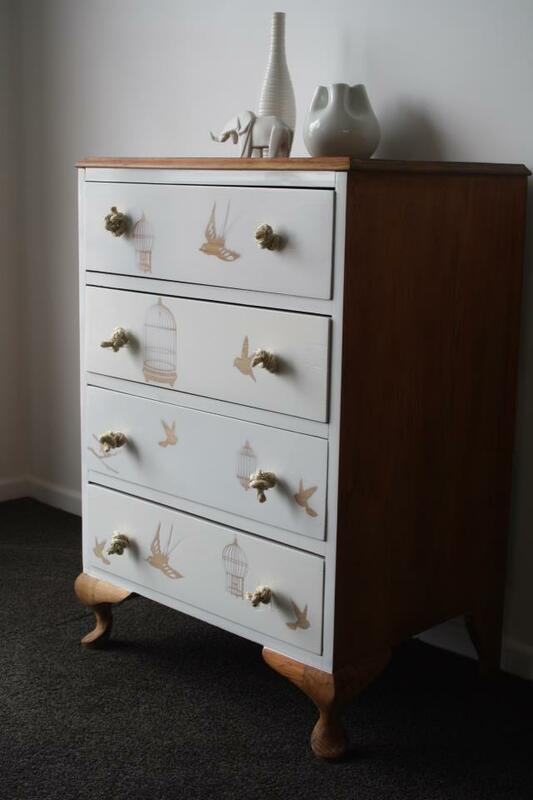 I've seen overseas shipping enquiries, requests for commissioned work... it looks as though your limited edition and one-off pieces of furniture are in hot demand. How does it feel? The support and comments on my Facebook page is what has kept me enthusiastic about what I am doing, just an overwhelming response to something that I feel really excited about, love it. I get VERY excited about posting pics of the latest design for the week. I finally feel like I am doing something I was meant to do, and that satisfies me from the inside out. Finally found my passion…. How would you describe your personal style and how is this reflected in your own home? Pre Draw’n In, I had a friend come over for drinks one night and I explained how trapped I felt in doing something that just paid the bills. I said "People keep saying to me just follow your passion…" I had no idea what that was and that made me even more frustrated! She said "ARE YOU KIDDING ME??!! Have you looked at the two houses you have renovated lately?" almost shouting at me she said "design or interior design is what is for you!" and I have not forgotten it. I have loved renovating our previous house and now the one we are working on, every single aspect, I get a real kick out of seeing visions come together. I can't describe my personal style, it is what it is and it works for me, and others apparently hahaha. Huge thanks to EJ for her time and for sharing her personal journey with us. 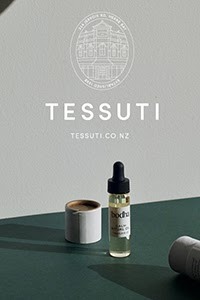 I'm looking forward to seeing a lot more of her work on Trade Me, and beyond. To stay in the loop, pop over and like the Draw'n In Facebook page. ...now this is one smart creative lass I'm envious of. 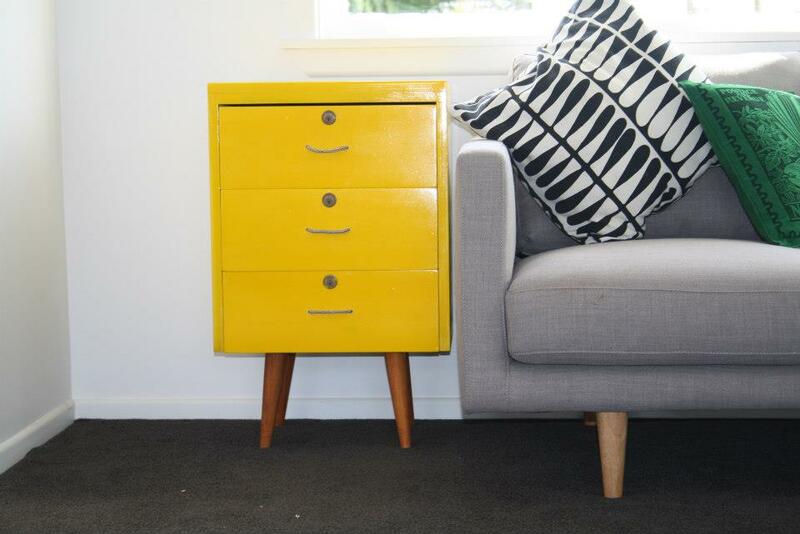 Ive always had ideas/thoughts of doing something similar-ish and have a collection of vintage drawers from our kitchen reno and inorganic days sitting in our shed waiting for a project. These are very very lovely. 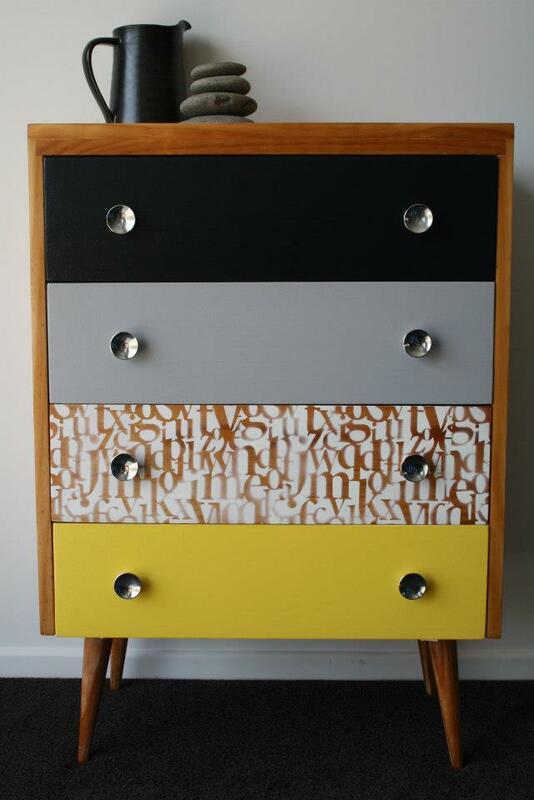 but proud to be the owner of a set of her wonderful drawers.. shes an inspiration! They are phenomenal! 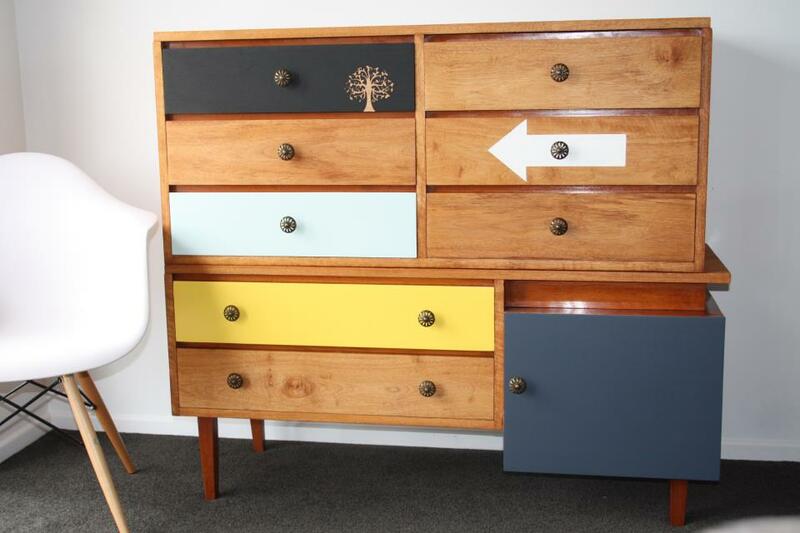 EJ has an incredible eye for composition of and complimentary colours for her drawers. Have just started following your blog and am finding it super inspirational. 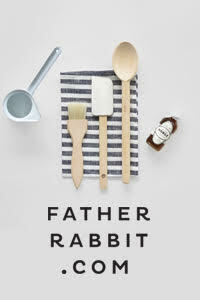 Thanks Design Chaser. mamaslider. i'm so going to try this.